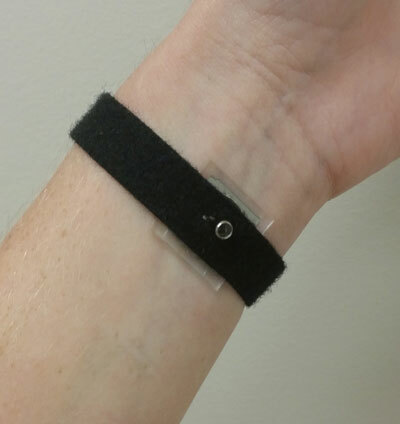 (Nanowerk News) Researchers from North Carolina State University have developed a new, wearable sensor that uses silver nanowires to monitor electrophysiological signals, such as electrocardiography (EKG) or electromyography (EMG). The new sensor is as accurate as the “wet electrode” sensors used in hospitals, but can be used for long-term monitoring and is more accurate than existing sensors when a patient is moving. Long-term monitoring of electrophysiological signals can be used to track patient health or assist in medical research, and may also be used in the development of new powered prosthetics that respond to a patient’s muscular signals. Electrophysiological sensors used in hospitals, such as EKGs, use wet electrodes that rely on an electrolytic gel between the sensor and the patient’s skin to improve the sensor’s ability to pick up the body’s electrical signals. However, this technology poses problems for long-term monitoring, because the gel dries up – irritating the patient’s skin and making the sensor less accurate. The new nanowire sensor is comparable to the wet sensors in terms of signal quality, but is a “dry” electrode – it doesn’t use a gel layer, so doesn’t pose the same problems that wet sensors do. The sensors stem from Zhu’s earlier work to create highly conductive and elastic conductors made from silver nanowires, and consist of one layer of nanowires in a stretchable polymer. The new sensor is also more accurate than existing technologies at monitoring electrophysiological signals when a patient is in motion. The new sensors are also compatible with standard EKG- and EMG-reading devices. An uncorrected proof of the paper, “Wearable Silver Nanowire Dry Electrodes for Electrophysiological Sensing”, was published online Jan. 14 in RSC Advances, immediately after acceptance. Lead author of the paper is Amanda Myers, a Ph.D. student at NC State. The paper was co-authored by Dr. Helen Huang, an associate professor in the joint biomedical engineering program at NC State and the University of North Carolina at Chapel Hill.